I became interested in exploring the area of augmented reality as well as the transformation of space through color and light. I started with a 3d visualization of the space using Processing, and the construction of three light-boxes. I connected the lights to the visualiztion with a basic stamp and a set of relays. Very simply, interaction with the virtual space controlled the physical space. Nine spheres are visualized in the virtual space, colored red, blue and green. Clicking on a sphere, then clicking on a box causes the light to move into the box, and turn on a light. After a short period of time, the sphere drifts out of the box, and the light turns off. 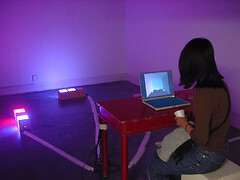 The peice explores a simple resonance between physical space, and code space. View the Java applet here.